The Kings XI Punjab are coming off a tough loss against the Chennai Super Kings where they were in the game till the 14th or 15th over, and then as Captain Ashwin said, they just didn’t flick the switch and lost the match in spite of have set batsman towards the end. They will take a lot of positives from that game, at the same time will learn about the pacing of a run chase. The Sunrisers Hyderabad on the other hand, are coming off a bad performance against the Mumbai Indians where they let an easy game slip away. The dependence on Warner and Bairstow has been clearly established now as the middle order looked very thin. Batsman like Vijay Shankar and Manish Pandey have to take more responsibility in the middle order. 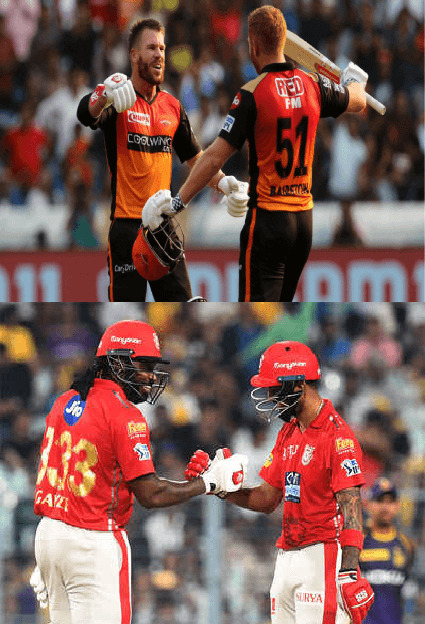 Out of the 12 matches played between the two teams, The Sunrisers Hyderabad have clearly dominated with 9 victories to their name. At Mohali, the Sunrisers have won 4 out of the 5 games played. Chris Gayle, for the Kings XI Punjab will be looking to come back strong after missing out against the Chennai Super Kings. He has done well at Mohali in the past and will be looking to add more runs at this venue. David Warner, for the Sunrisers Hyderabad, has missed out on his last two matches after having a great start to the tournament. He will be looking to get back into the runs against a team he has traditionally done well against. The Kings XI Punjab will not look to make too many changes. They might consider getting Mujeeb Ur-Rahman or Hardus Viljoen back in for Andrew Tye. The pitch at Mohali is expected to help the fast bowlers for an over or two early on, but then will come on to the bat very nicely. Spinners might get some purchase if they bowl in the right areas. A high scoring game is on the cards. Both teams are similar in terms of over dependence on the openers to fire. However, the Sunrisers Hyderabad will start as favorites given both their openers are in top form and they have a good bowling attack as well. The Kings XI Punjab will be looking to get Warner and Bairstow out early which will expose the weak middle order of the Sunrisers. Bairstow has got out to leg spin in every single innings in this year’s IPL so far. His play against spin is definitely not as good, hence both Ashwin’s should try to get him out. Warner has struggled against left arm seamers taking the ball away and hence they should try Sam Curran bowling to Warner with the new ball. The Sunrisers Hyderabad will look to get Gayle and Rahul out early on. Gayle has struggle against Sandeep Sharma and has had a poor history against off spinners. Hence, Nabi is also an option against Gayle. KL Rahul off late has looked to take the innings deep, not taking too many risks and hence keeping it tight against him and not letting him rotate strike will put pressure on him, which will lead to him getting out.